Washington D.C. is meant to be all glamour, politics and great conversations but what do you do when you don’t have the words to join in? Or the knowledge to ride the subway? Or you’re scared someone will mug you? 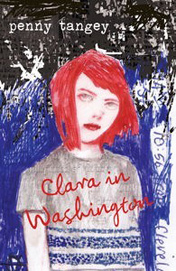 Joining her mother on a trip to Washington is Clara’s end-of-school adventure and a chance to be someone else other than the studious geek she’s always been. Although, starting an adventure is hard to do when you won’t leave the house. But Clara didn’t count on meeting Campbell and his anarchist group and she didn’t count on her new discoveries threatening to unravel all her plans. Will she still be the same after Washington? An Anarchist FAQ is a good starting point to learn more about anarchism. Wrapped in a very entertaining coming-of-age story, this is a fun read, but also quite a thoughtful one. A novel which manages to be both breezy and thought-provoking. Much of the humour is generated through insightful observations of people and their pretensions.